Summary: As of mid-May 2018, Google has reverted back to shorter display snippets. Our data suggests these changes are widespread and that most meta descriptions are being cut off in the previous range of about 155–160 characters. Back in December, Google made a significant shift in how they displayed search snippets, with our research showing many snippets over 300 characters. Over the weekend, they seem to have rolled back that change (Danny Sullivan partially confirmed this on Twitter on May 14). Besides the obvious question — What are the new limits? — it may leave you wondering how to cope when the rules keep changing. None of us have a crystal ball, but I’m going to attempt to answer both questions based on what we know today. I pulled all available search snippets from the MozCast 10K (page-1 Google results for 10,000 keywords), since that’s a data set we collect daily and that has a rich history. There were 89,383 display snippets across that data set on the morning of May 15. So, we know that longer snippets do still exist. Note, though, that both of these snippets come from Wikipedia, which is an exception to many SEO rules. Are these long descriptions only fringe cases? Looking at the mean (or even the median, in this case) doesn’t really tell us. This looks very different from our data back in December, and is clearly clustered in the 150–175 character range. We see a few Google display snippets cut off after the 300+ range, but those are dwarfed by the shorter cut-offs. We can see pretty clearly that the bulk of cut-offs are happening in the 145–165 character range. Before December, our previous guidelines for meta descriptions were to keep them below 155 characters, so it appears that Google has more-or-less reverted to the old rules. Keep in mind that Google uses proportional fonts, so there is no exact character limit. Some people have hypothesized a pixel-width limit, like with title tags, but I’ve found that more difficult to pin down with multi-line snippets (the situation gets even weirder on mobile results). Practically, it’s also difficult to write to a pixel limit. The data suggests that 155 characters is a reasonable approximation. To the Wayback Machine… ?! Some sites don’t have meta descriptions at all. Wikipedia happens to be one of them. Now, Google’s understanding of Wikipedia’s content is much deeper than most sites (thanks, in part, to Wikidata), but many sites do fare fine without the tag. If your choice is to either write bad, repetitive tags or leave them blank, then I’d say leave them blank and let Google sort it out. You could just write to the length you think is ideal for any given page (within reason), and if the snippets get cut off, don’t worry about it. Maybe the ellipsis (…) adds intrigue. I’m half-joking, but the reality is that a cut-off isn’t the kiss of death. A good description should entice people to want to read more. You could go back and mercilessly hack all of your hard work back to 155 characters. I think this is generally going to be time badly spent and may result in even worse search snippets. If you want to rewrite shorter Meta Descriptions for your most important pages, that’s perfectly reasonable, but keep in mind that some results are still showing longer snippets and this situation will continue to evolve. I’ve been a bit obsessed with the “inverted pyramid” style of writing lately. This is a journalistic style where you start with the lead or summary of your main point and then break that down into the details, data, and context. While this approach is well suited to the web, its origins come from layout limitations in print. You never knew when your editor would have to cut your article short to fit the available space, so the inverted pyramid style helped guarantee that the most important part would usually be spared. What if we took this approach to meta descriptions? In other words, why not write a 150-character “lead” that summarizes the page, and then add 150 characters of useful but less essential detail (when adding that detail makes sense and provides value)? The 150/150 isn’t a magic number — you could even do 100/100 or 100/200. The key is to make sure that the text before the cut can stand on its own. 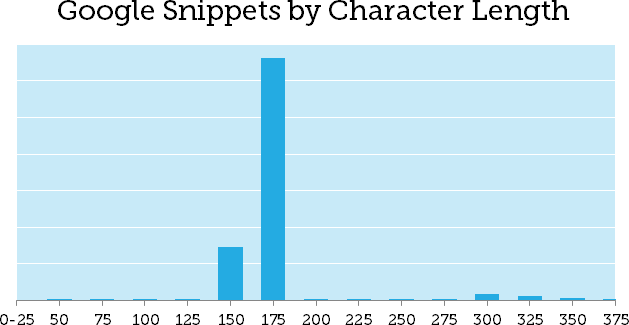 In December, we reported that Google increased search snippets to over 300 characters. Unfortunately, it looks like the rules have changed again. 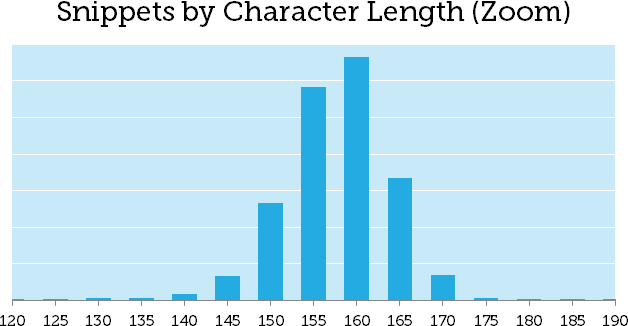 According to our new research (May 2018), the limit is back to 155-160 characters. How should SEOs adapt to these changes? Line 1 has the short version of the story and hopefully lets searchers know they’re heading down the right path. Line 2 dives into a few details and gives away just enough data (hopefully) to be intriguing. If Google uses the longer description, it should work nicely, but if they don’t, we shouldn’t be any worse for wear. Is this worth the effort? I think writing effective descriptions that engage search visitors is still very important, in theory (and that this indirectly impacts even ranking), but you may find you can write perfectly well within a 155-character limit. We also have to face the reality that Google seems to be rewriting more and more descriptions. This is difficult to measure, as many rewrites are partial, but there’s no guarantee that your meta description will be used as written. Is there any way to tell when a longer snippet (>300 characters) will still be used? Some SEOs have hypothesized a link between longer snippets and featured snippets at the top of the page. In our overall data set, 13.3% of all SERPs had featured snippets. If we look at just SERPs with a maximum display snippet length of 160 characters (i.e. no result was longer than 160 characters), the featured snippet occurrence was 11.4%. If we look at SERPs with at least one display snippet over 300 characters, featured snippets occurred at a rate of 41.8%. While that second data set is fairly small, it is a striking difference. There does seem to be some connection between Google’s ability to extract answers in the form of featured snippets and their ability or willingness to display longer search snippets. In many cases, though, these longer snippets are rewrites or taken directly from the page, so even then there’s no guarantee that Google will use your longer meta description. For now, it appears that the 155-character guideline is back in play. If you’ve already increased some of your meta descriptions, I don’t think there’s any reason to panic. It might make sense to rewrite overly-long descriptions on critical pages, especially if the cut-offs are leading to bad results. If you do choose to rewrite some of them, consider the 150/150 approach — at least then you’ll be a bit more future-proofed. Previous Post:Is using Yoast in WordPress to exclude landing pages from the XML sitemap and include a noindex tag sufficient to keep them from being found in search results? Next Post:How Has Technology Impacted Your Business?